3 Camouflage switches. If you want your switch plate and outlet covers to blend into the wall, lightly sand the switch plate and outlet covers with sandpaper, then brush on a coat of primer. Use leftover wall paint to paint the switch plate and outlet covers after the primer is dry. Learn how I painted plastic outlet covers here. 4. Do not cheap out on paint! You definitely get what you pay for when it comes to buying paint. I learned the hard way cheap paint costs more because it doesn’t last. If you are a landlord and have a lot of painting to do, ask the paint store if they offer a landlord discount. 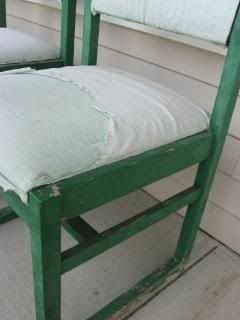 A chair I painted with dollar store spray paint one year later. 5. Painting uneven walls. 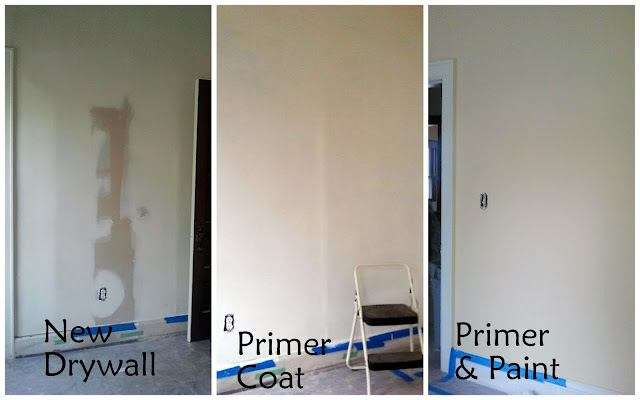 If you painting uneven plaster walls, it is worth the extra money to buy self leveling paint. This project is the first time I used self leveling paint because we painted old plaster walls and new drywall in the same rooms. Self leveling paint glided so clean and smooth across the uneven plaster walls I thought I was painting new drywall. This is the brand and type of self leveling paint we used. 6. Defuzz your paint roller. To keep new roller fuzz out of your paint job and messing with your wall, wrap the roller in painter’s tape and remove it the first time you use it. Think of it as using a giant lint brush on your paint roller. 7. Do not use paint as primer. Paint and primer are designed to do two different things and are not interchangeable. Primer seals porous surfaces like new drywall and helps the paint bond to the surface you are painting. Tinting your primer will reduce the number of coats you will need of a dark paint color. If you like to use no VOC paint, you can buy no VOC primers too. If we didn't use primer the paint would have soaked into the drywall. With primer the paint is where it should be on the wall not in it. 8. How do you tell if a wall is oil or latex? Rub a cotton ball full of rubbing alcohol over the painted surface. If your cotton ball has paint on it, the surface has latex (water based) paint on it. If not, the surface is oil based paint. 9. An easier way to fix paint mistakes. I think it is easier to fix mistakes if I paint in this order ceiling, wall, and paint the trim last. There isn’t a right or wrong order to paint these things. The same thing goes for cutting in. 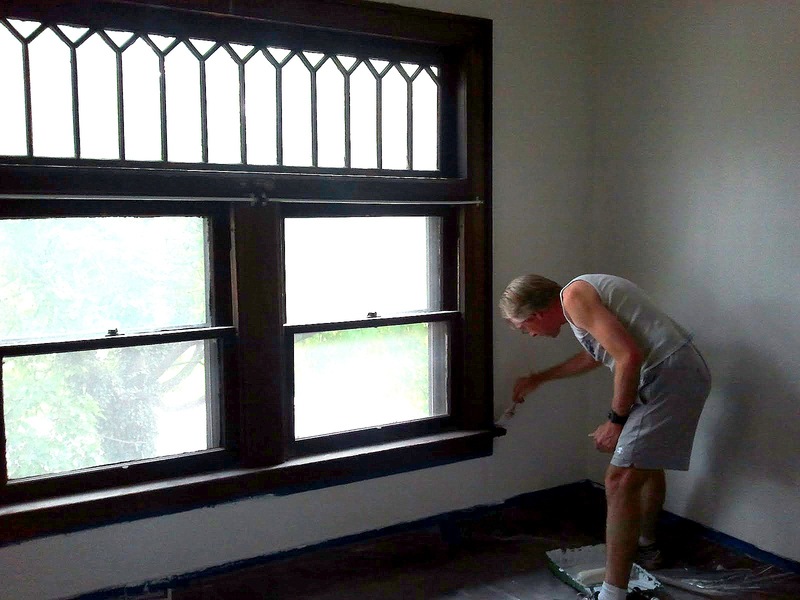 Some people cut in around trim, walls, ceilings, and corners first and then fill it in with a roller. Others do it last. Either way is cool. 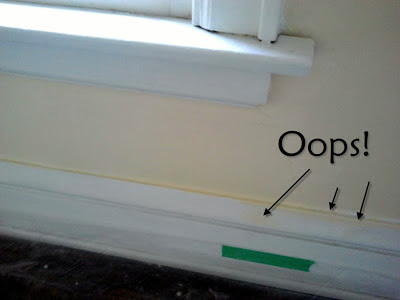 Painting the baseboard will fix the mistake I made when I painted the wall. 10. Prevent paint feathering. Lightly run a utility knife around your painter's tape before you remove it from the surface to prevent the paint from feathering or accidentally removing new paint from the wall. 11. Wrap it! If you need to use your painting tools for multiple days, wrap them in plastic wrap or put them in a plastic bag and store them in the refrigerator. You can do the same thing with the paint tray. I have kept a paints and pans from drying out this way for a week or more. 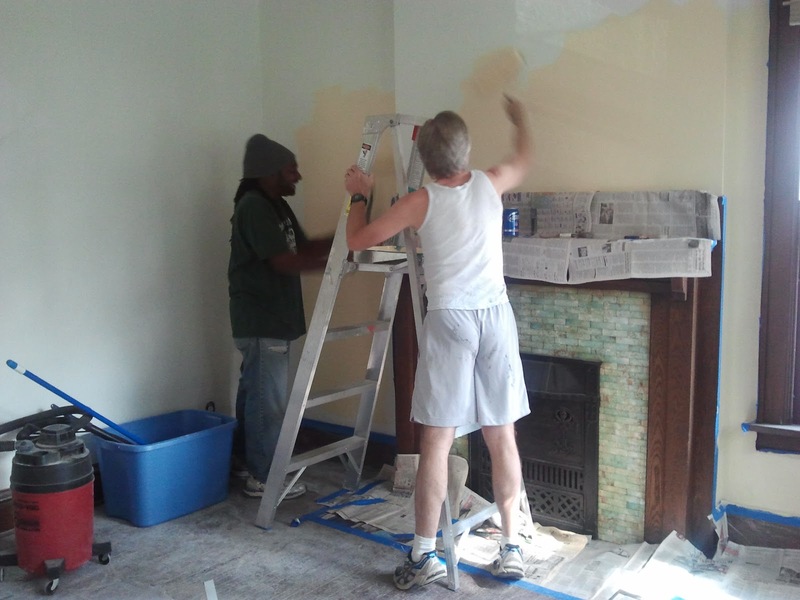 Chris and Husband finishing the last bit of painting before the pizza guy comes. What are your paint tips and tricks? This is a great list! I'm totally pinning this! I host a weekly Friday link-up party and I would love it if you would link this or any other great posts up sometime! Thanks for your tips! Very easy and helpful! There were definitely some tips here I've never heard of before! Pinning this! Wow thanks for sharing this at my Thursday link party! 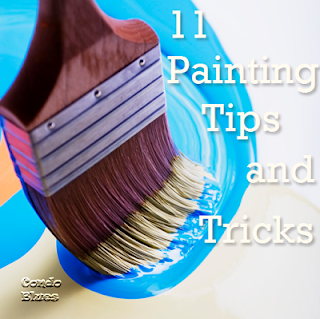 I looove reading about painting tips because I have lots of grand plans for painting my house in the near future! I am definitely pinning this for future reference! Thanks again and hope to see you this week! Thanks for the tips! Found you over at Monday Funday!